We found the best product on the market with Apron Attitudes. Our aprons take a beating but they have outlasted all the others!! Great fabric, terrific patterns and quality work. Thank you Mary! Jill Monti (Regional Marketing Manager - New England Dairy Promotion Board)"
THIS IS WHAT THEY SAID ABOUT APRONATTITUDES.COM!!! "We were so pleased to work with Apron Attitudes on our recent event to support The Great American Milk Drive. We were looking for a way to connect with customers at a local grocery store to invite them to make a donation of milk to the local food bank. When I found the "Hot Cow" apron on the ApronAttitudes.com website, I knew we were onto something! Mary was excellent to work with and turned our order around very quickly to meet our deadline for the event. The aprons got lots of compliments and helped us snag 932 gallons of milk for the local food bank!! Thank you again for your work to get the aprons to us in time! Best Regards, Jill Monti (Regional Marketing Manager - New England Dairy Promotion Board)"
We were thrilled & honored to have www.ApronAttitudes.com in our Celebrity Catwalk Tinsel & Tails Fundraiser. Their aprons are whimsical, high quality and absolutely added style & holiday spirit to our NYC event. We're looking forward to working with them in the future! I am a Pink Zebra consultant and do many vender and craft show events. 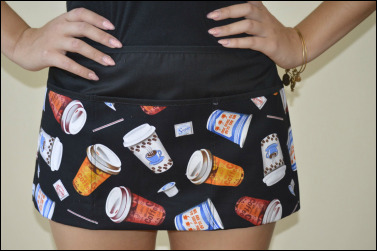 I was looking for something cute and sassy to wear to the events to hold money, pens business cards etc. Look no further, I bought my first apron from apron attitudes and LOVE IT. I purchased 2 more to match mine for my daughters so we all match and match in style!! They ship super fast and very professional. I highly recommend contacting Apron Attitudes for your business needs!!! Thank you Mary!!! Apron Attitudes makes a great product. We have been using her aprons for 3 years and they wash up really well. We have not had any problems with seems, fraying, or fabric wear. It is so nice to be able to trust a company to make a quality product and purchase over the internet with confidence. We are purchasing additional products for our new Salon . Thanks Mary!! !.